Find hotel near Memorial To Homosexuals P ..
A lot of countries in the World still find the concept of Homosexuality a forbidden topic to discuss about, let alone accepting it. During the Socialist regime, homosexuality was considered a crime. A lot of people were convicted of this ‘sin’ and today Berlin realizes how unfortunate it was to prosecute people of something that they cannot even be blamed for. Hence, this memorial to the Homosexuals prosecuted under the Nationalist Social Regime is an accountant of the most unfortunate happenings and victims of history and decisions that would be regretted forever. The memorial for public visit for 24 hours. 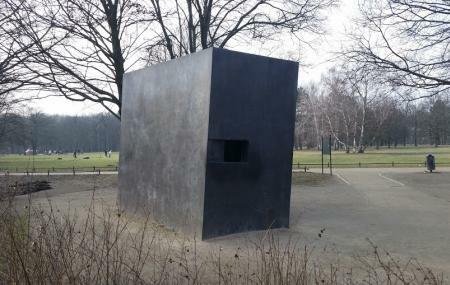 How popular is Memorial To Homosexuals Persecuted Under Nazism? People normally club together Käthe-Kollwitz-Museum and Berlin State Opera while planning their visit to Memorial To Homosexuals Persecuted Under Nazism. People also prefer to start their day with Memorial To Homosexuals Persecuted Under Nazism. A sculptural work which follows the line of the Jewish Memorial. It can be hard to miss, then most of the information about it - with a photo of Lilly and Felice (Aimee and Jaguar) - it's far away when it should be closer to the sculpture. If you would like to read more about LGBT life during WW2 in Berlin, then, please do read "Aimee and Jaguar". Very moving memorial. The memorial is to the gays "persecuted by the Nazis". It doesn't mention the extermination though in its name, like the Roma and Sinti memorial but that is what it was--a genocide of a minority. I liked the simple concept of it's video messaging: gay couples kissing (a male couple then a female couple) against a backdrop of persecution and fight for rights in silence, housed in a stark, drab immoveable monument. The video is viewed through a window in the side of the monument and it loops for about two minutes. Something so simple and intimate yet basic and human, set against images of persecution, murder, stigma and people fighting for acceptance. The images cross into modern time. The image of the gay man being hung is a reminder people are still persecuted and killed today for being gay. Homophobia and bigotry can be witnessed in the comment here about this exelent monument. Probably one of the first public monuments to integrate a digital feature. Innovative! Bring your kids. Homosexuality isn't obscene. It's natural and beautiful. The projection inside is an emotionally moving display of homosexual kissing in front of scenes of gay persecution during wwii.